I Surrender All – Really? Why? I grew up in an evangelical, pentecostal church, which is to say, I grew up singing ” I surrender all. I surrender all. All to Thee, my blessed Savior, I surrender all.” I didn’t think a lot about the words. I didn’t need to. The message seemed pretty clear at the time. A few years ago I did some thinking about the message. I don’t sing that song any more. There are a few reasons I don’t sing “I surrender all” any more. The main reason is that I don’t surrender all. When I began to consider what I was really saying, I realized that not only did I not surrender all, I decided that it was impossible to surrender all, not just for me, but for anyone. It is kinda like the idea of loving God with all my heart, mind, soul and strength. All means every second of everyday. It’s impossible. Not gonna happen. It’s a worthy goal that all Christians strive for, but will not happen this side of eternity. Singing “I surrender all made me feel like a liar and a hypocrite. So I quit singing it. I look around at others singing that song with gusto, and think “If you really have surrendered all, the more power to you! But I have my doubts.” Hopefully what they really mean to say is that I really want to surrender all and am moving in that direction. I have been helping out in a home for needy children in Mexico for almost 11 years now. There are three homes for needy children in Mexico run by Foundation For His Ministry. It was started by Charla Pereau 50 years ago. I admire Charla as much or more than anyone I know. She was at the home for needy children in Oaxaca, Mexico, where I serve, a few years ago. We have devotions every morning and she was to speak one morning. Before she spoke, most everyone sang the old standard, “I surrender all.” Then Charla began to speak. This soldier of the faith, this fount of wisdom, this woman who has not received a salary in all her years of leadership and is the epitome of Jesus admonition, ” deny yourself daily”, said “I can’t sing `I surrender all`”. I sing “I surrender some.” And she went on to talk about the difficulty and challenge of the words “I surrender all.” My admiration for her grew even greater that day! That song was sung in church the other day, and I began to think about it more. I thought about that word SURRENDER and what it connotes. I thought of a crook sticking a gun in my face and demanding my wallet. I surrender my wallet, but I am not happy about it. I don’t give him my money because he loves me and wants me to be happy. I relinquish my dough under force. I thought of General U. S. Grant when he laid siege to Vicksburg in the Civil War. The people of the city were starving to death. The Confederate General, John Pemberton, who had at one time before the war helped Grant out financially, sent a message to Grant asking for honorable terms of surrender. Grant wrote back saying that all he would accept was immediate and unconditional surrender! The Confederate General did surrender his troops and the city, although he was mighty angry about the unconditional surrender. From then on Grant was known as Unconditional Surrender Grant. Is that how we should think about God? Unconditional Surrender God? The New Testament does not use the word surrender. 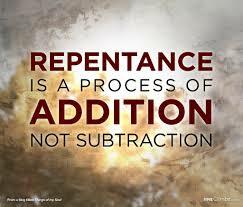 It uses the word “repent”, which has a much different meaning than surrender. It means “to radically change the way you think about something. ” God does not ask us to surrender anything, especially by force. He asks us to change the way we think about things like our possessions and behavior. When the Holy Spirit opens the eyes of our hearts and gives us a new perspective on our things, attitudes and behavior, we gladly give up material possessions or modify our actions because we come to the realization that God really does love us and really does want us to be happy, and that by getting rid of stuff and changing the way we do things, we will, indeed be happier.